This article is by guest author Ashley Reynolds for CentaurFencing.net. Used with permission. In this article we will review three types of temporary fencing and how effective they are to use. We will cover wire fencing kits, panel fencing, and wire/braid/tape fencing. Temporary horse fencing is just as it sounds. 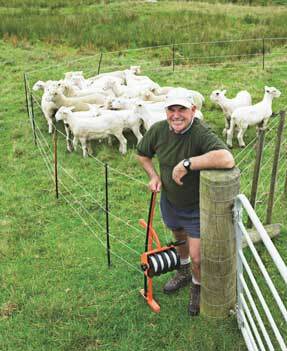 It is livestock grade fencing that is meant to be used on a temporary basis only. Generally, temporary fencing is easy to install and easy to take down when you are ready to build permanent horse fencing. It is used when an enclosure is needed for interim purposes while an equine facility grows and financially expands until more permanent fencing can be built. Temporary fencing can also be used when you are away at shows and need temporary stalls. Wire kit fencing is used by creating a psychological barrier between the fence and the animal. If they touch the electrified wire, it will send them a pulse of electricity and it is enough of an electrified pulse that they learn to stay away from the fence. Wire kit fencing is easier to install and requires less maintenance because horses are less likely to chew on the wire fencing unlike vinyl or wood rails. Since animals avoid the fence, the fencing usually lasts longer too. The portability of wire kit fencing allows for frequent changes of the fencing to allow for animals to be taken in and out of the enclosed area often and with ease. It is very easy to install and can be installed almost anywhere and it is just as easily taken down to be moved or removed. You can use wire kit fencing products like the SmartFence found on http://www.gallagherfence.net/products/smart-fence-portable-corral for a variety of uses. If you have a damaged permanent fence, you can set up the SmartFence or a similar product as a secondary barrier until the permanent fence is fixed. If you have trees, an area with dangerous holes, silage containers, or have hay bales in a field that you do not want the horses to get to, you can fence these areas off with the wire kit fencing as an effective method for keeping horses away from these areas. If you need to create smaller enclosures within a larger one, you can also use the wire fencing to build an internal pasture. You can find a great panel fencing example at http://www.corrals2go.com/corrals-2-go-portable-horse-corral-uses with their portable panels. Panels are easy to set up and to take down but they remain sturdy and strong when they are set up. You can create a multitude of fencing designs such as squares, rectangles, octagons, and more to suit your needs. Panels are also very easy to use if you have to build fencing around an immobile object such as a tree or property lines. They can be used as temporary stalls. They can be used as portable travel corrals. They can be used as feeding slots for when you are feeding multiple horses at once. The list goes on to what they can be used for whether you are at home, on the farm or the surrounding areas, or away from home. The only real downside is that they are fairly heavy to transport and can be cumbersome to set up. Wire, braid, and tape fencing are great temporary fencing options. They are easy to install, easy to remove or take down, and easy to alternate locations when you are working with a small space. These fencing types work with conductors and electricity to create a psychological barrier, much like the wire kit fencing. When installed correctly, the electrified wire, braid, and tape fencing can take on the impacts of a panicked horse in flight and the impact of wildlife trying to go through the fence. You can use multiple products with tapes on the top strand and another strand in the middle with the strands between being wire. This creates a highly visible barrier for horses to see. If you have wooden posts with a top rail, you can use wires for the remaining strands to still have the benefit of electrified fencing until you can acquire the remaining wooden rails. Tape, braid, and wire fencing can also be used as temporary fencing if a permanent fence is damaged or broken. If you are thinking about using this type of fencing option, there is also very little maintenance work required with wire, braid, and tape fencing. Horses should respect the electricity so they will not ‘crib’ or chew on the fence strands. In some cases, it may also be used to teach horses to stop cribbing. This article was contributed by guest author Ashley Reynolds for CentaurFencing.net and is being used with permission. At CentaurFencing.net they are passionate about horses. As they developed their business, it was their number one goal to provide the best quality products and merchandise at the absolute lowest prices in order to provide each individual horse owner with the opportunity to have a safe and beautiful environment for their horses. Please be sure to visit their website at CentaurFencing.net.